Hi there and Happy Saturday! It's time for another challenge over at Our Creative Corner. This week, I am your hostess and I have a fun theme challenge to try out. We're getting "All Ruffled Up"! 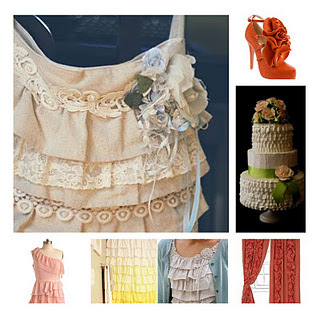 In all of my browsing on Pinterest recently, I noticed that "ruffles" are a pretty popular trend right now. On everything from fashion to food to home decor, they are popping up everywhere. I decided to ruffle up some lace and some Glimmer Paper for my project. 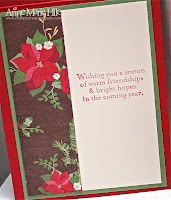 Now, this is not a card you are going to pop in an envelope and mail...there is a LOT of dimension. My intention was to add it to a hand-delivered gift, as part of the packaging. I found an awesome video by Julie DiMatteo on how to create a paper lollie with a punched trim. you can find it by clicking HERE. Just a tip, I started with a 2" x 12" piece of Red Glimmer Paper for the lollie and a 1- 3/4" punched circle for the back of the lollie to hold it together. (Those are a little different then the measurements in the video.) Julie's tip in the video to use a hot glue gun is REALLY helpful. I tried liquid glue at first but couldn't get it to hold. The Glimmer Paper is super-thick, so the hot glue gun made it SO much easier to hold in place. I sure hope you will join us this week and get "All Ruffled Up" over at Our Creative Corner. Please stop by and see what the rest of the lovely ladies on the Design Team have created. Thanks so much for visiting today! Ann this card is so cute! Love it! You're the hostess with the mostest! Your project is fabulous Anne Marie. I did a double-take looking at the pics before I read about the velcro. How clever are you!?!? 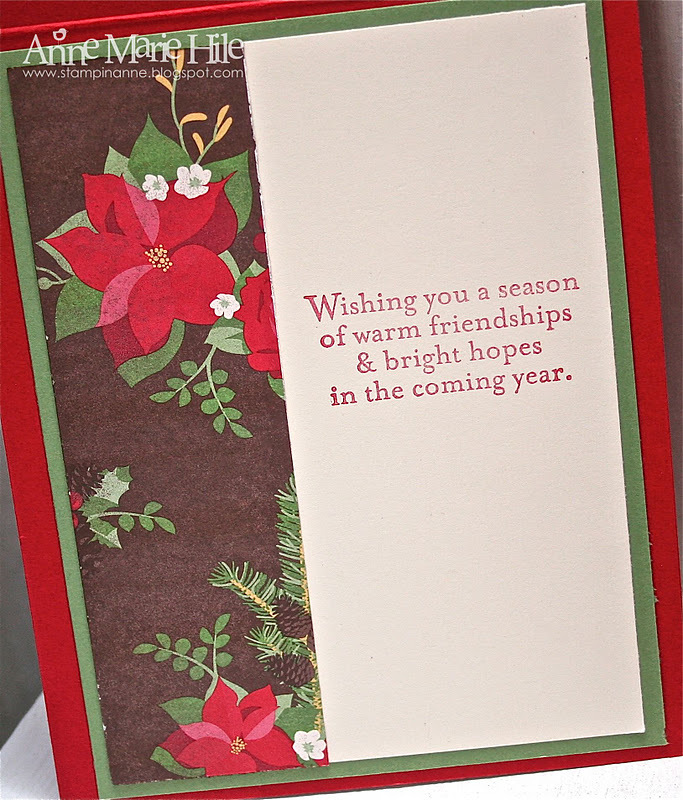 And both pieces, card and ornament, are simply gorgeous in their own right. Hi sweet Anne. This is just stunning. How do you come up with those beautiful layout beauties! You are the queen of the card making blog world, that's for sure! I love this card. What pretty little thing! 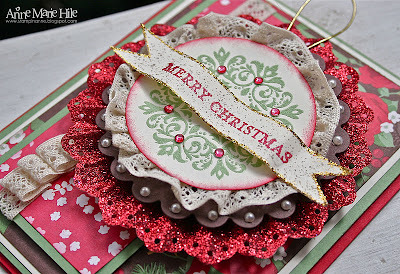 So creative to have a card with an ornament! Love this pretty, "ruffly" card! Very pretty. Oh wow! Anne Marie this is totally ruffle-y gorgeousness! How absolutely cool is this!!!! Gorgeous...and it is an ornament too???? You slay me!! lol....Thanks for the inspiration, once again! Oh my goodness, you certainly met the challenge! I have always been a ruffle and glitzy girl, so this card and challenge hit a home-run with me. And what a wonderful idea that it's an ornament too. You pulled out all the stops for this one Anne Marie and it definitely shows. This is stunning AM! Love that it is an ornament! super cute girl!! I totally made me think of some ruffled bloomers... seriously cute!!! Wowza!! I was thinking "What a FAT card...even for Anne!" LOL But with the removable ornament, it makes sense! Gorgeous! Wow! That really is a lot of pretty ruffles! I love how you used the glimmer paper to create the back ruffle. I bet this really sparkles and shines in person! Thanks so much for sharing! 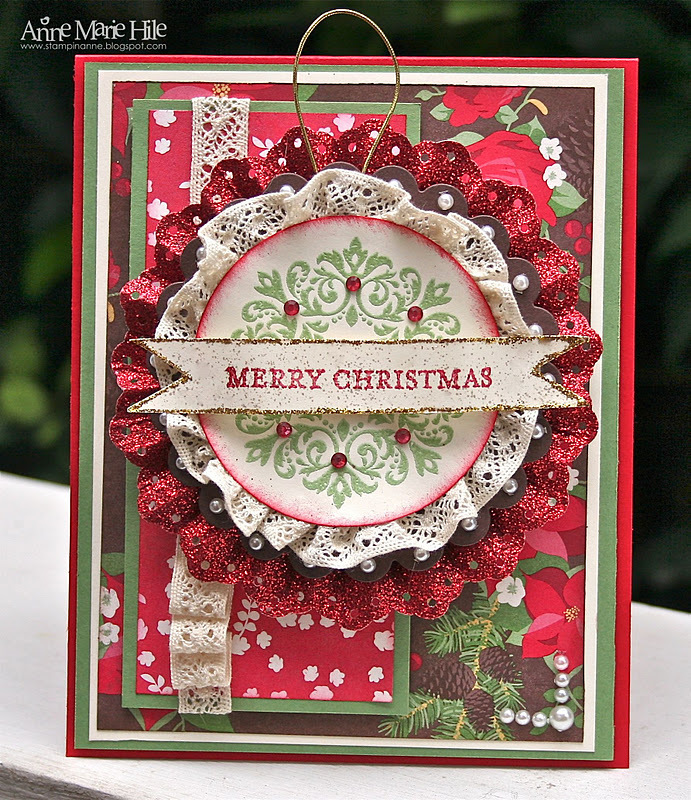 Nothing prettier than ruffles - and this card is no exception! Gorgeous - and I love that it is an ornament! Ooooh, this is fabulous! Sure like this one, love that you can take it off and hang on the tree! Wow! I LOVE IT! and the fact that you had enough fore-thought to create an ornament-card is fantastic! I love all the ruffles and layers. super pretty! and I love the banner. great work,& a great challenge! So pretty! Love your different layers and the idea to attach with velcro is a great tip! You have shared such a great idea, it might jumpstart my own creativity! Gorgeous! 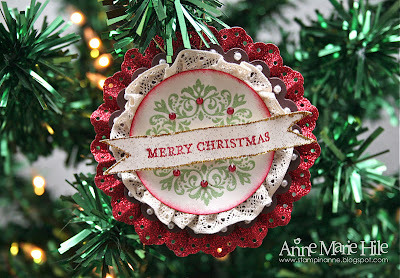 I'm drooling over all of those ruffly layers on the beautiful ornament (btw-genius! )and card! Fantastic job! !